The Employer Team is developed an Employer Resource Guide and began presenting to healthcare employers in the fall of 2014. The Community has developed a Communications Plan, including a website with the help of Magnify Good, a communications strategy firm brought from assistance of The Patterson Foundation. The Academic Team is focused upon employer/academic partnerships. 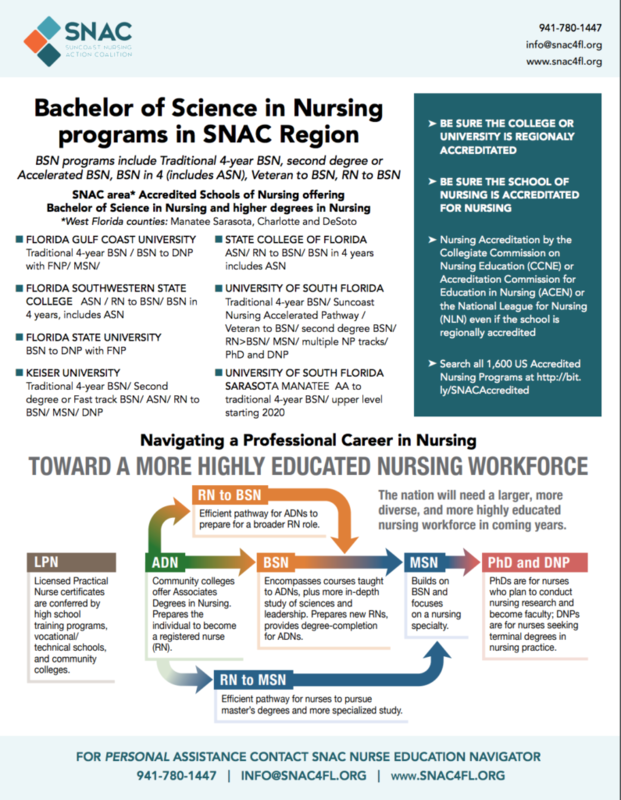 The Nursing Education Advisor Task Force defined and created the foundation for a new full-time resource of a Nurse Navigator to provide academic program information, referrals and support to assist individuals in Sarasota, Manatee, Charlotte and DeSoto Counties. This role will help individuals interested in nursing or current nurses without a baccalaureate degree to select, enroll in and successfully complete a Bachelor of Science Degree in Nursing, or higher, from regionally accredited academic institutions and programs.